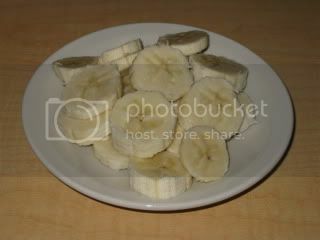 It was actually pretty fun to slice up my banana this way and eat it. I need to remember that because fun eating makes eating fun! Spinning today was soooo tough! My legs were just plain tired and tight – they were burning during the warm up with no tension on the bike *sigh* I suffered through it all but tried pushing myself. I ended up burning 391 calories for my 45 minute session – not too shabby. I made up lunch last night to marinate like I did the with the Citrus ChickPea Salad. 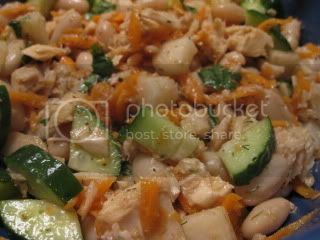 I LOVED this salad ~ it was definitely packed with protein and kept me going all afternoon. 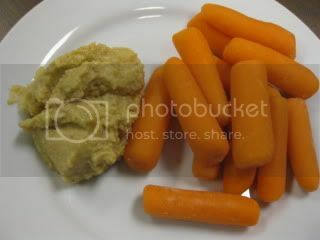 I was excited for my afternoon snack Hummus and Carrots. I was too lazy to peel my big carrots so I opted for organic baby carrots. I have never made hummus without Tahini, but, the one in the book called for NO Tahini. I had to check out my jar to see why because I honestly thought there were not any calories/fat. Shocker ~ check out your jar next time, it has ALOT of calories and Fat. To get the Tahini Flavor, I added toasted sesame seeds. Instead of using my bullet or food processor, I whipped this up in my Black & Decker Mini Chopper. It was done in minutes and actually tastes pretty phenomenal! Coming up next ~ another awesome spa salad, plus giveaways galore including my Mr. Krispers Giveaway ~ yeah! « Win the book by joining our Bikini Bootcamp Challenge! I loved the white bean & tuna salad too. Hearty without being heavy. Can't wait to see your dinner! I just finished circuit and core and I'm going to BED. Sorry spinning was hard, but it sounds like you did great anyways! That sounds like a great hummus recipe, and the tuna salad looks yummy! The dressing sounds so good. Yum on the hummus! I am going to have to try that one out! I always make my hummus without tahini; I like it so much better for some reason! Trader Joe's also makes a hummus with no tahini (it's their Original Hummus) and it is terrific – only 1 POINT for 2 tbsp. I loveeee my hummus! That recipe sounds great! Way to go with the class – sorry it was tough! i kid you not i was shoving a hummus-covered baby carrot in my mouth as i read the part about your snack! how random! thanks for the hummus recipe, i am collecting them.. next time i run out of hummus i want to make my own! but it wont be awhile, ive got the costco sabra in the fridge. i have a mini chopper! what a great reason to use it..
Angelea ~ I saw that you used Sabra and I was soooo jealous! I LOVE Sabra, but, this homemade version is up there with maybe being better 🙂 Great job on the circuits and Core workouts. Anne ~ I think sometimes your body just gets tired and tells you it is tired. C.G. ~ ohhh – do tell if you try it and like it. I am thinking of trying to come up with something for this month's mystery challenge. Marisa ~ That is good to know – I need to check that out the next time I am at TJ's.